Our Catalonia Adventure Tour is a thrilling holiday that will leave no man or woman indifferent. From the luxury of our hotel we venture out on the Costa Brava coastline to go on a kayak tour, do a via ferrata along the rugged coastline, mountain bike in the Meditteranean forest and go an a tapas tour in Barcelona. After the day´s activity there will plenty of time off to relax on the beach, snorkel, or visit beautiful towns like Tossa de Mar, Gerona or Barcelona. 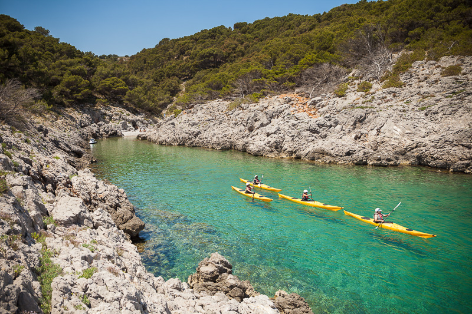 Discovering the Costa Brava with a kayak is an unforgettable experience. Kayaking on the cristal clear waters of the Meditteranean from cove to cove via impressive cliffs and caves, this is sea-kayaking at its best. We will be able to get to beaches that are only reachable with a kayak or on foot and we will have plenty of time to sunbathe, relax and have a picnic on the beach and of course do some snorkelling! A transfer picks us up from the hotel and takes us to the starting point of our trip (20 min). - Duration: 6 hours approx, including free time and picnic. - Level: This is not a difficult trip but you need to have a minimum of physical condition to be able to enjoy the tour. A via ferrata is a is a protected climbing route with steel cables attached to the rocks. You are secured at all time and a professional climbing instructor will be there at all times. The via ferrata of Sant Feliu de Guixols is the only one on the world that goes along the coast and it is an amazing experience. This via ferrata is for beginners but for people with experience it still will be an absolute thrill! You are free to do anything you want today. Relax on the beach or a the pool, visit Barcelona, Gerona or Tossa de Mar, the choice is yours. ​We are going to mountain bike along some great trails in the Montnegre Nature Reserve. We can easily adjust the level of the trip to the abilities of the group. We will teach you some tricks and tips, try a bit of easy downhill and enjoy a picnic in the forest. The title says it all. We are going for tapas in Barcelona. We hop from tapas to tapas bar and on the way we take you through the most beautiful and less touristy places. Pure bliss if you like your food and wine!